Fr. Carl Kabat, omi entered the property at a nuclear bomb plant under construction in Kansas City on July 4, as he did last year. He named his action the 85% Pruning Hooks action – the title stems from the fact that the plant produces approximately 85% of the non-nuclear components for our nation’s nuclear weapons. Fr. Kabat also has re-styled Independence Day as “Interdependence Day” in honor of the interconnection of all nature. Fr. Kabat faces three criminal charges after cutting through a fence and entering the grounds of the Kansas City Plant, a major new nuclear weapons facility under construction, to call attention to its building. The priest’s action represents the latest in a years-long campaign by activists to call attention to the facility’s construction. Protests at the site, construction of which is estimated to cost $1.2 billion and scheduled to be partially operational by early 2013, have been led in part by area Catholics who have also been leading petition campaigns to remove funding from the site. One of the petitions, focused on developing a plan for reuse of the facility should it be abandoned in light of weapons cuts, was unanimously passed by the local city council in March. Fr. Kabat reportedly told the National Catholic Reporter that he first entered the property of the Kansas City complex Tuesday, using bolt cutters to make a hole in a perimeter fence and walking through. He then spent Tuesday night on the grounds of the complex until he was found and arrested Wednesday morning. He has been charged with 2 counts of trespass and one charge of property destruction. He was detained in the Kansas City detention center on a $750 bond. Each count carries a maxium of six months and $500 fine. Aug 21 is Fr Carl’s first court appearance. At the age of 78, Fr. Carl Kabat, OMI has continued his life’s work of doing “nonviolent public resistance to evil” by embodying Isaiah’s prophecy of beating swords into plowshares. He has spent over 18 years in prison for this witness. I, Fr. Carl Kabat, omi, have decided to celebrate Independence Day July 4th, 2012 (better named Interdependence Day) at the New Nuclear Bomb Factory in Kansas City, Missouri. 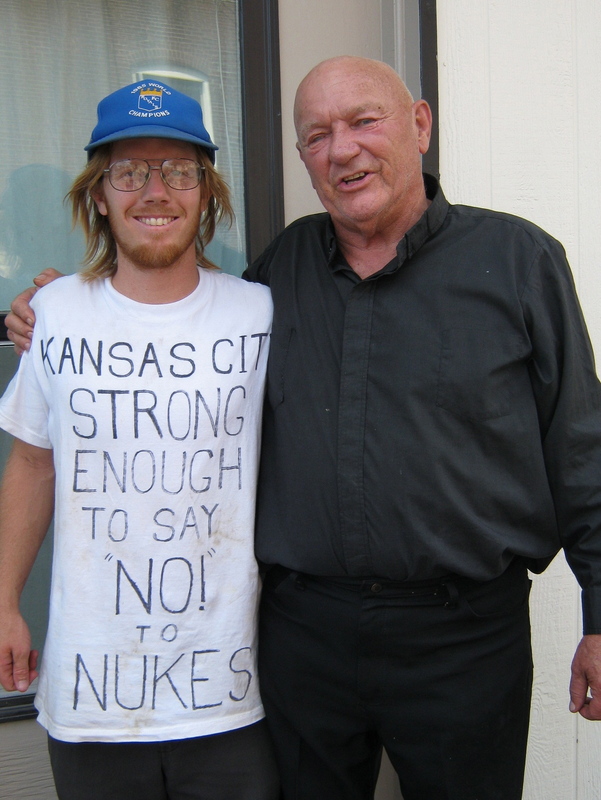 Eighty-Five percent (85%) of the nuclear bombs we (the US Citizens) own were made in Kansas City and 85% of all our future bombs will be made at this new factory in Kansas City. The bombs we dropped on Japan have killed over one hundred thousand (100,000) of our Japanese sisters and brothers, plus five of our own Air-force personnel being held in jails there. This includes those sisters and brothers immediately vaporized and those who died slow deaths over the following weeks, months even years. The Nazis killed and burned approximately six million (6,000,000) Jews and five million (5,000,000) others. One of our Minuteman III’s could kill approximately three million (3,000,000) of our sisters and brothers. We have perfected the “art” of killing and burning of sisters and brothers to the point that what the Nazis accomplished in years, we can do in minutes. Four Minuteman III’s could kill twelve million (12,000,000) of our sisters and brothers. We (and others) have perfected the killing of sisters and brothers to the ultimate. Dum-Dum Bullets and poison gas are outlawed by International Law. The opinion of the International Court in 1995 states that nuclear weapons are a Crime Against Humanity!